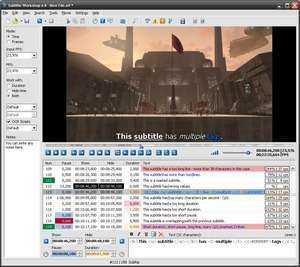 Subtitle Workshop supports all the subtitle formats you can work with and has all the features you want from a subtitle editing software. It has an user friendly interface, can handle both time and frame based subtitles, performs massive subtitle conversion and can check for and fix errors in subtitles. Subtitle Workshop makes subtitle creating / editing / converting tasks almost a pleasure. The friendly and intuitive interface mixes easy to access menus and must have features with advanced functions and a remarkable speed and stability, drastically reducing subtitle editing time. Version 6.0e is a freeware program which does not have restrictions and it's free so it doesn't cost anything. For security reasons, you should also check out the Subtitle Workshop download at LO4D.com which includes virus and malware tests. Additional screenshots of this application download may be available, too. Subtitle Workshop has a presence on social networks. Subtitle Workshop download been highly rated by our users.